It’s a 80×8 display with three colours – Red Green, and Red/Green mixed to produce Orange. It measures about 35x4cm in size so is ideal for something eye catching. Best part is that it’s available for just £20 from the Embeded Adventures website. It’s ready assembled so you don’t have to get out your soldering iron. 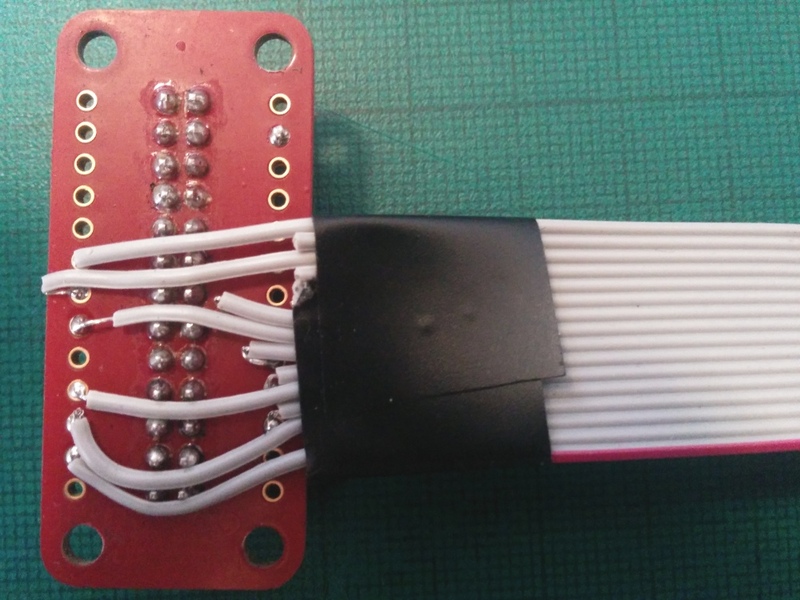 To connect to your Pi’s GPIO follow the instructions on this page – which includes a handy python script by Pete Goss. For the wiring guide note that the numbers refer to the number of the pins as you count across, not the GPIO number. This is also for the Rev 2 board model A or B (if you have mounting holes, your Pi is fine). I found that it will work powered just from the GPIO of the Pi, but if you need a brighter display you can just hook up a 5 volt power supply (e.g. a spare USB charger) to the central pins – this doesn’t need to be connected to anything else. The lower pin (with the printed text on the back the right way up) is ground – I used the cable off a novelty LED light from Poundland. For the cable you can use jumpers or for something more permanent I found this Maplin GPIO breakout board available for £3.49 to be ideal. The LDP8008 comes supplied with a ribbon cable you can use. Here’s a closeup of my cable – by cutting the grey cable different lengths you can make it quite neat. I also added a plastic cover cut from a spare toolbox divider. Note that in my case, the labels on the Maplin GPIO breakout board were incorrect – make sure you double check everything before plugging it into your PI so you don’t break it!I also found the display a little sluggish if anything else is running. For extra neatness I mounted the whole setup in a box frame – the one I used came from Wilkinson’s and was £6. Great post! This inspired me to do something with my Pi a little more technical than use it as a media (XBMC) center. I wanted to make a scrolling stock ticker with python. I purchased the same 80×8 display from Embedded Adventures and a pre-assembled break-out board for the GPIO pins. I’m not too well versed in soldering and figured it’d be more of a hassle to learn so I used M/F jumper wires to connect the break-out pins into the LDP cable. All I can get when I run the script (thanks for the link btw) is a bit of flickering and some random LED scrolling. And sometimes NONE of the LED’s light up. I wired and rewired the everything to be sure the correct pins were connected up but to no avail. I also have connected the jumpers straight to the pi then into the cable a well as straight onto the pins of the LDP. I don’t have enough experience with this kind of stuff to determine if this a power problem or a software issue or God forbid the hardware itself is malfunctioning. I currently don’t use a power supply for the LED matrix, which could be the issue, I just don’t know for sure. If you have any ideas about what could be going on i’d be grateful to hear them. sounds like a power issue. Although the display worked with my Pi (a model A) without connecting it to a power supply it was very faint. Cool thanks for the response! I’ll look more into getting a dedicated power supply, any suggestions? How did you manage to power up the display unit, am not really a techie person but am learning and this looks so great. Thanks for your reply but my question is where exactly do you solder the USB Cable on the display unit or on the breakout board and secondly I tried soldering the grey cable on the breakout board but the sequence or where exactly each strip of the cable goes is not really clear. I do sincerely apologise for asking a lot of questions but am really new to this and every little help or clarification is well appreciated. No worries – so the display unit has 2 connections on it – the grey ribbon cable, and then near the middle 2 screw terminals. I’ve connected these two up separately. I was able to make the display work (just) by connecting the ribbon cable to the Pi, using the instructions in my post, however it was a little bit dim and flickered, so by adding an additional 5 volt power supply to the central pins (with negative the bottom pin +5volts the top pin) the display is much brighter. Because USB includes a 5 volt supply I used a USB cable connected to a separate power supply to boost the power to the board. If soldering up a cable is a bit daunting, I’d suggest buying a breadboard and a kit like the Pi T Cobbler – http://www.adafruit.com/product/1105 and some jumper wires and making a temporary connection between the board and the Pi. Once you’ve got that working you could then move on to making a permanent soldered board like the one in my post. I’m about to do a new post on this project as Embedded Adventures now have a driver board built for this display – the connection between the Pi and the driver board is much simpler. I’ve also neatened up the case a bit. If you’re still stuck feel free to ask! – I can post more pictures of how I’ve connected the board if that helps. Thanks so much for the reply, the only bit that am struggling where each stripe of wire on the grey cable is soldered on the breakout board. On the board there are little text e.g. 5v0, TXD,+PWM,P23 etc, this is the part am struggling with, which wire goes where and also the USB cable where exactly to solder it , i really dont want to end up blowing up the display unit or my raspberry pi. If not I will wait for more pictures if thats not a problem with you. I really honestly do appreciate your time and effort in assisting me with this. In the ldp.py file, the line in the elif n ==2: section that says gpio.output(B,2) is this wrong? Did you ever get it to work with a 64×16? I am trying to get it to work. Did you get it to fully work with the LDP6416 board? Keep meaning to update this blog – I’m now using the embedded adventures display driver which runs the display via serial commands (it even has fonts). As the driver is 5 volts the Pi needs a logic level converter but it’s quite simple to do. My aim is to have the Pi run as a web server and process messages to display on the board. After I did all the code and ran it, nothing is displayed. Also, what pins did you use to hook up the r2 and g2? It works fine with the original code, but when i make the changes is when it stops displaying. I am trying to make the same connection posted on this page but I have got a different result. Now I will explain in details what I have done and what I have got so that you can understand and help me solving the problem!! After that I just simply made the connection between them using normal Female to Female jumpers based on the above table. Moreover, I have connected the LDP 8008 to the power using USB cable as you mentioned in a previous reply. Plus, I have made the normal connection for the raspberry Pi with its peripherals ( Monitor, keyboard, mouse, and to the power). After the physical connection is completed, when I switch on the power, the last row of the LDP 8008 is turned on only with red color. I did consider this as a problem and I have continued. Only rows 2,3,6,and 7 are turned on with green color and the letter A is being displayed in the middle of the sign with reed color but has been cut from the middle because rows 4 and 5 are off and from the top because rows 0 and 1 are off. So that I went back and change the jumper wire connected to B wondering that it may be damaged.Unfortunately, this changed nothing. PLEASE read my reply and try answer as soon as possible, I need it work because it part of my Graduation project. Th dead line is 3ed of may. Please if any one has an idea, just share it with me.